We can build on the earlier custom Arc shape code to create a custom shape that draws a slice of a pie. We only need to add a line segment back to the origin and set options to close the resulting curve and to fill in the middle. 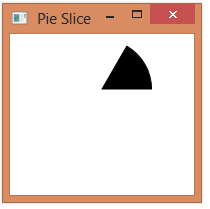 To use the PieSlice from XAML, we specify a stroke color (for the outline), a fill color, and start and end angles. Is there any option to add Click on PieSlice? To let binding work, you should define Start and End angle metadata as FrameworkPropertyMetadata with FrameworkPropertyMetadataOptions.AffectsRender flag set. Otherwise, setting the value at runtime will not affect the control.